News from the world of maths: Do you know what's good for you - what's the best medicine? How do you judge the risks and benefits of new medical treatments, or of lifestyle choices? With a finite health care budget, how do you decide which treatments should be made freely available on the NHS? Historically, decisions like these have been made on the basis of doctors' individual experiences with how these treatments perform, but over recent decades the approach to answering these questions has become increasingly rational. Statistics and maths are used not just to test new treatments, but also to measure such fuzzy terms as quality of life, and to figure out which treatments provide most "health for money". While the decisions of health authorities affect all our lives, the underlying calculations are rarely discussed in the media. To explore these difficult decisions and the role of maths in evidence-based medicine, we have put together a package of six articles, three podcasts, a career interview and a classroom activity. To celebrate pi day on the 14th of March 2010, a mathematician and a magician will attempt to pull off what promises to be the world's largest live online magic trick — and you can join in via Twitter! The mathematician James Grime and the magician Brian Brushwood will exploit the magical power of mathematics to read your mind over the internet. Visit the pi day magic website for instructions on how to join up to this record-breaking attempt, and watch this space for an explanation of how it's done to be published after the event. The trick will be part of the Cambridge Science Festival, which runs from the 8th to the 21st of March 2001. Hey Plus-team, shouldn't it say March 14th? Thanks Max and Martin, you're right, it's March 14th! Sorry!! What's March 14th (14/03/10) got to do with Pi? This post has been removed by a blog administrator. New treatments and drugs are tested extensively before they come on the market using randomised controlled trials (RCTs). We talk to David Spiegelhalter (Winton Professor of the Public Understanding of Risk), Sheila Bird (Professor at the Medical Research Council Biostatistics Unit), and Nigel Hawkes (journalist and director of Straight Statistics) about why RCTs are used and how they test if a new treatment works. You can also read an accompanying article. News from the world of maths: Calling all algebraic artists! Everyone has the chance to create mathematical beauty as part of a competition during the Cambridge Science Festival. As part of the Imaginary exhibition of beautiful mathematical images and artwork taken from algebraic geometry and differential geometry, visitors (both real and virtual) can create their own mathematical art. By downloading the SURFER program, anyone can create images of algebraic surfaces by simple equations using the three spatial coordinates of x, y and z. 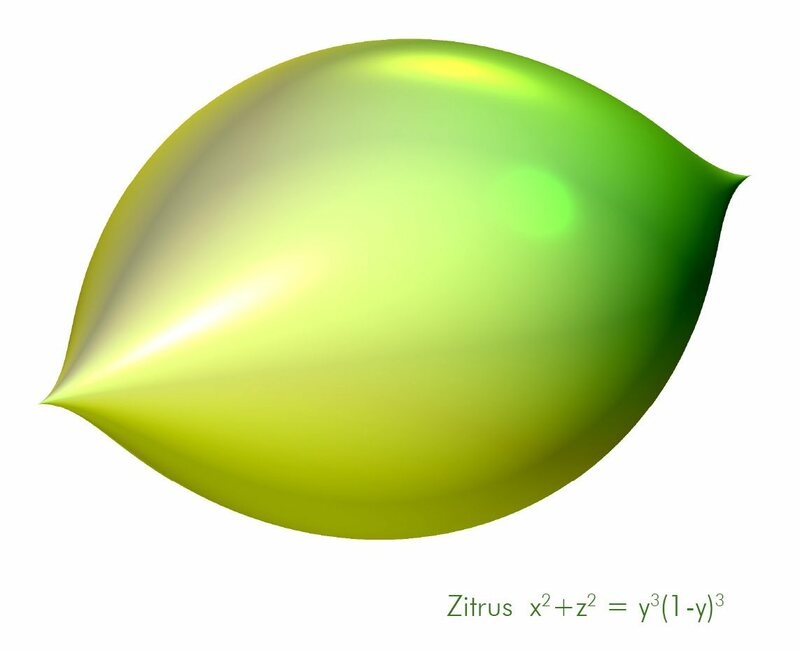 For example, the equation x2 + y2 + z2 = 1 results in a sphere. The competition requires creativity, intuition and mathematical skill in order to create equations yourself or to change given equations to produce beautiful images. The images are easily generated with the SURFER programme, and you can then upload your artwork to the competition gallery by 20 March. Everybody is invited to take part, including group entries from classes and families. The entries will be judged by a distinguished panel including Sir Christopher Frayling (Royal College of Art and Arts Council England) and Conrad Shawcross (sculptor and artist-in-residence at the Science Museum, London). So good luck to all aspiring artists, and if you need some inspiration why not browse through the Plus articles on maths and art. News from the world of maths: What does mathematics feel like? What does mathematics feel like? If you have ever wondered what it feels like to do mathematics, take a look at the series of beautiful short films produced by the mathematics department at the University of Bristol. Chrystal Cherniwchan, Azita Ghassemi and Jon Keating interviewed over 60 mathematicians, asking them to describe the emotional aspects of maths research. The discussions range from the role of creativity and beauty in maths, to what it feels like to pursue the wrong research path, and the eureka moment of discovering mathematical truth. You can view them all on the Mathematical Ethnographies site. You can also read more about beauty in mathematics, in Plus, as well as the mathematical lives of John Conway, Stephen Hawking and Gerardus 't Hooft and many others in our careers with maths library. Marcus du Sautoy is a mathematician and Charles Simonyi Professor for the Public Understanding of Science. In this TED talk he explores how the world turns on symmetry — from the spin of subatomic particles to the dizzying beauty of an arabesque — complete with an introduction to groups. Beckham in his prime numbers.